Commercial Roofing Toronto | Flat Roof Repair Contractors in the GTA! SMC Group Inc. is a provider of Commercial Roofing Services and Flat Roof Repair in Toronto. SMC Group is your best choice for all your roofing needs including roof repair, modified bitumen roofing, built-up roofing, TPO roofing and single-ply roofing. We take charge of the planning, safe execution and proactive maintenance of commercial and industrial roofing projects. Commercial and industrial property owners across the GTA trust SMC Group to manage, maintain and repair their flat roofs. Call us today (416) 731-7737, we look forward to speaking with you! Call Us at (416) 731-7737 or fill out the form below and one of our roofing experts will be in touch with you shortly. Flat roof leaks are often a surprise, and property owners in Toronto and the GTA may find, when faced with this situation, that they don’t know where to turn. At SMC Group, emergency calls are a top priority. We provide emergency flat roofing repair service around the clock, seven days a week. Our experienced roofing contractors will identify the cause of your leak and execute the necessary repairs quickly and efficiently. We are one-stop solution provider handling everything from monitoring to investigation to speedy resolution. When replacing a flat roof there are a lot of factors that you will want to consider. There are many unique issues that are exclusive to each building and to each project but there are some that are common among all projects… safety, quality and documented inspections. Property managers in Toronto have several types of commercial roofing systems available to them including asphalt, modified bitumen and TPO roofing to name a few. The roofing contractors at SMC Group have extensive expertise installing various types of commercial and industrial roofing systems. Our roofing company experts will conduct a thorough inspection of your property and recommend the best roofing system for your building. 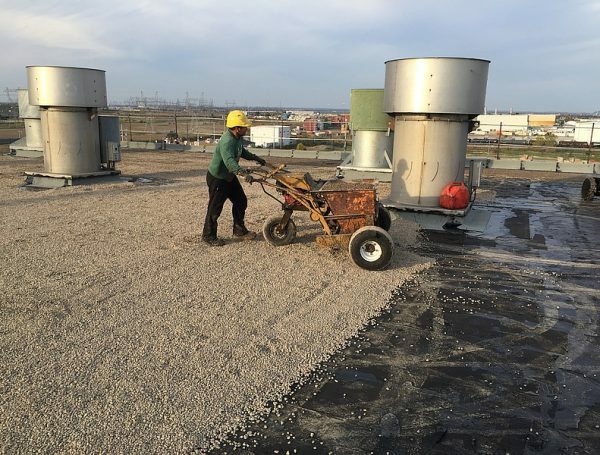 Comprehensive flat roof condition evaluation is critical to identify improvement opportunities that will reduce ownership costs and maximize roof service life. SMC Group’s evaluation procedures are built on thoroughness and accuracy. We will determine roof life expectancy and identify problem areas so you can avoid being blindsided by unexpected costs. Our report will also provide strategies for minimizing your long term operating and maintenance expenses. We examine the existing roof system to identify the cause of defects, the extent of damage and the potential impact on future roof performance. You receive a written report that outlines your roof’s history, composition and condition of each component—illustrated by detailed roof plans and photographs. A Roof Asset Management Program (RAMP) is a more sophisticated and cost-effective approach to roof management allowing us to effectively predict and control costs over the long term. A building owner/operator often needs help to stay on top of all the necessary inspections, required repairs, maintenance and to keep an eye on the roofing contractors to ensure quality, safety, NO FIRES, NO FLOODS, and warrantable outcome. There are several benefits of utilizing our formalized RAMP program. One of the major benefits is extending the service life of your roof. By analyzing the roof cost on a life cycle basis, lower costs can be achieved through extending the life of the roof. This results in less disruption to the business and less land fill waste. We always strive to protect our clients by confirming that the solutions you invest in meet all of your roofing and building portfolio needs. When it comes to SMC Group’s Project Management Service, you can be confident the work that is delivered on your roofing project is the work you paid for. You will experience improved cost, maintenance scheduling, quality control, and vastly improved project outcomes. Our project management and general roof contracting services are designed to deliver projects on time and on budget. Our goal is to extend the service life of your roofs through quality of service, maintenance and materials. Our people and systems are focused on providing the optimal return on our client’s dollars. Our attention to detail and approach to a client’s project is built into our methodology for project success. We typically become an integral part of our clients’ team and help create a win-win between savings and value-added services. Whether you are designing a new roof or replacing an existing one, your roofing project will benefit from our detail oriented approach. Our structured design specifications mean you are far less likely to face unexpected extras and budget overruns. Selecting a flat roofing system and choosing the right roofing contractor are critical decisions for project success. SMC Group will help you cut through the clutter of choices, saving you time and helping you make the right decisions. Today a wide selection of roofing products can be installed on your roof. From the traditional built-up (asphalt & gravel) roofs, to polymer modified asphalt roofing membranes, or energy saving single-ply (PVC, TPO, EPDM) roofing systems, and roof coatings. Each of these systems can provide excellent long-term roofing performance when installed on the appropriate building. No single type of roofing product will fit the needs of all buildings. Typically, we will look at several options and refine the final choice of roof system in discussions with the client to fit their building using the above criteria. Good specifications outlining the application of the chosen roofing system communicate the necessary technical requirements during the construction process. These requirements establish a benchmark that can be inspected for compliance and acceptance. A specification package will include the following components. We focus solely on providing solutions to meet your needs!